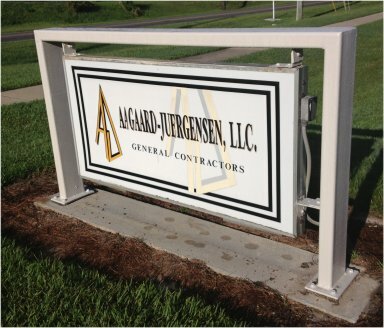 Aagaard-Juergensen (AJC) is a general contractor and design build firm, providing engineering and architectural design services for every phase of construction. AJC starts with due diligence in the selection through complete design of the site, plus building and completion of construction. AJC takes the lead in every aspect of due diligence in providing storm water requirements, parking allocation based on building size, ventilation, location of utilities, and a water focus, as well as electrical, piping, plumbing, flooring, window and roofing requirements. AJC also arranges the site to match the needs of each business process, including employee access, customer access, warehousing and manufacturing functions. Geotechnical investigation, surveying and environmental surveys are also part of the mix. In programming the development of the building layout and space allocations, AJC identifies key wants and needs relative to business model requirements, taking into account how people operate and how individual businesses process most efficiently. This provides a seamless, single point of responsibility in communicating all client desires and wishes, while ensuring that everything from beginning to end is consistent. AJC Design Build Team process gives clients a single point of contact throughout the entire design and construction process, allowing clients to achieve the desired end result. AJC experience with third party inspections and investigations, designing, programming, constructing and serving as the owner's representative translates into the very best in design build. All of this brings together the correct team member skill sets, capable of asking the right questions to ensure a job well done and above expectations.